Like many women my age, I grew up with Hello Kitty. Somewhere in a drawer or on a shelf in my parents' house, a large collection of stickers, pencil cases, erasers, and note pads, is hiding out, waiting to see daylight again. They are all unmarked, unused, and unpeeled, making me wonder today whether their pristine nature is more a sign of childhood restraint or of deference. It doesn't matter. Although Hello Kitty now belongs to a whole new generation where she can be a blinged out, luxury brand, pop culture icon in her own right, it is nice to know that to a four year old girl like Simone, she is still just Hello Kitty, that wide-eyed, big headed, cute but mute (no mouth?) cat that is every bow-loving girly girl's cartoon dream. Posted by Charmaine at 3:27 p.m. 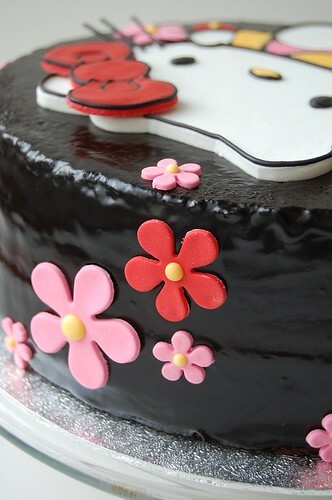 I love you decorations, the Hello Kitty theme is adorable and the chocolate glaze looks amazing! March 17, 2010 at 10:53 p.m.
OMG WOW! 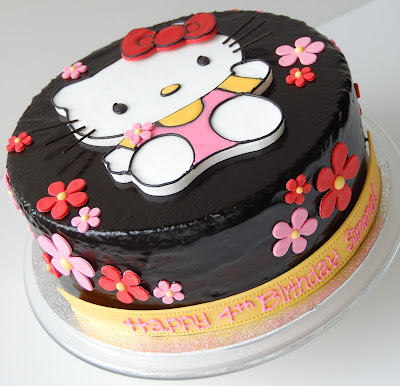 that is an amazing hello kitty cake!! LOVE IT! March 18, 2010 at 3:33 a.m. The glaze looks so nice. Is it the same one you used for the space cake? March 18, 2010 at 3:38 a.m.
Omg. 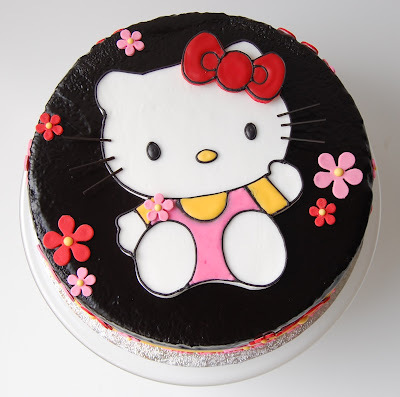 I Love your hello kitty cake. i saw it on foodgawker. March 18, 2010 at 10:09 a.m.
Hello. My name is keribel, and I've been reading your blog for a while now because I've been thinking about a career in Pastry... and it has helped me a lot. I still dont know if that is what I will do but anyway... I just wanted to say that this cake is beautiful! March 18, 2010 at 5:48 p.m. So cute! I was just thinking tonight about whether you can pipe frosting onto fondant; guess the answer's yes! What kind of frosting did you use for the black outlines? Great job! March 19, 2010 at 11:34 p.m. I love it! 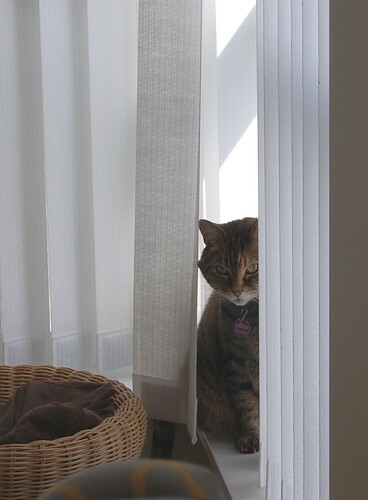 Im a big fan of hello kitty, but your cat is beautiful! March 21, 2010 at 10:19 a.m.
March 23, 2010 at 12:07 p.m. Absolutely love all your creations, great work!! March 25, 2010 at 11:08 a.m.
Wow! You always amaze me! March 26, 2010 at 1:00 p.m.
April 19, 2010 at 11:09 p.m.
gorgeous. the hello kitty is absolutely perfect. veeeeeery nice!! April 21, 2010 at 6:01 a.m.